As I've said before (eg. see previous post), it seems obvious to most people that mental illness is due to brain disease. Critical psychiatry doesn't stand a chance! It must be wrong to question this assumption. But, of course, critical psychiatry isn't saying that mind and brain are separate (see previous post). What it is saying is that minds are enabled but not reducible to brains. It's got the weight of philosophy behind it. 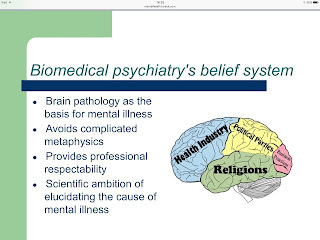 Furthermore, it is also saying that the assumption that mental illness is due to brain disease is not based on logic, but rather on faith, desire and wish fulfilment. As I've also said before (see previous post), psychiatry is more like a religion than a science. It's much simpler to believe that brain pathology is the basis for mental illness and that its nature and cause will eventually be discovered. Believing this can be a way of justifying psychiatric treatment. Actually, there's no need to justify treatment in this way. Mental health problems exist and professional expertise may be beneficial in treatment. The problem is that objectifying people through reducing their problems to brain disease may make psychiatry part of the problem rather than necessarily the solution to these problems. When people become psychiatric patients they become a property of the psychiatric system, from which is very difficult to escape. Only those who are too unpredictable and unlabellable become undesired by the priests of medical psychiatry who need full of control over their poor sheep. Old adage-- it takes 50 years for new ideas to take hold. It is not the fault of the ideas but rather it takes that long for people with fixed opposing old ideas to die. In 1967 David Cooper published Psychiatry Anti-Psychiatry and this week a remarkable development in Norway: a mandate from the country's Ministry of Health ordering psychiatric hospitals to provide the option of medication-free treatment. Unfortunately all is not well in the world -- in the Crimea the Russians are using Psychiatry to treat dissidents. how I can get you? I need to talk with you. If you don't have problem.